Flanked by columns, the barrel vaulted entrance of this three bedroom home is echoed in its dramatic arched windows and gables. In this house plan, interior columns add elegance while visually dividing foyer from dining room and great room from kitchen. The great room is made even larger by its cathedral ceiling and bank of windows, including an arched clerestory window. A box bay window adds space to the formal dining room, while the kitchen features an angled center island with breakfast counter for the busy family. 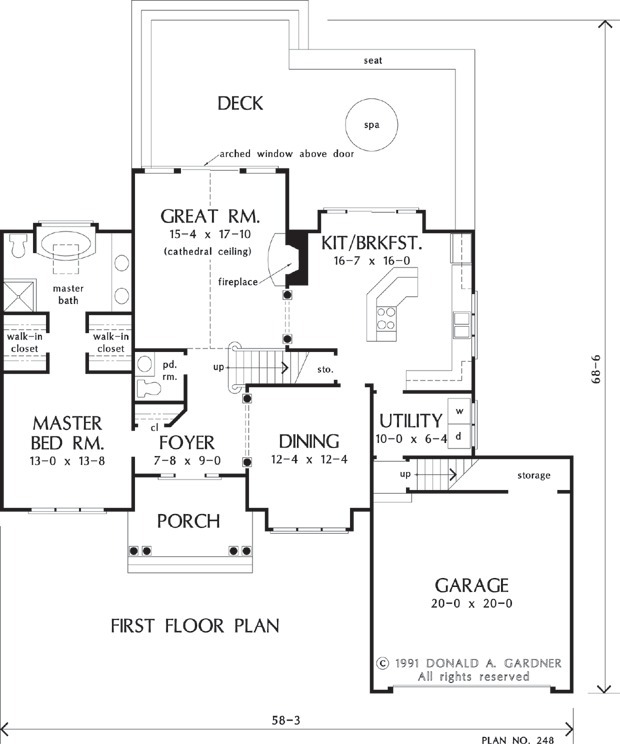 The floor plan's master suite, secluded on the first floor, boasts his and her walk-in closets and garden tub with skylight. Two bedrooms upstairs share another skylit bath. 2nd Floor: 445 Sq. Ft.
1st Floor: 1416 Sq. Ft. 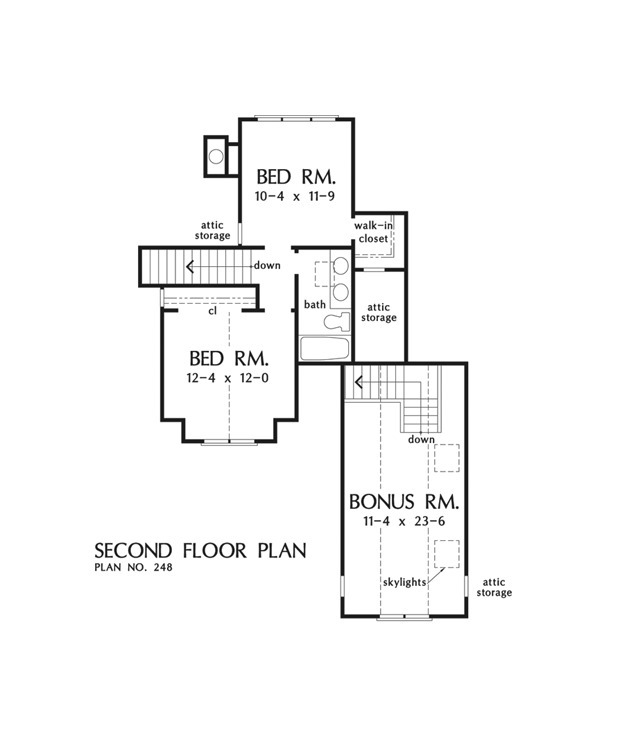 Bonus Room: 284 Sq. 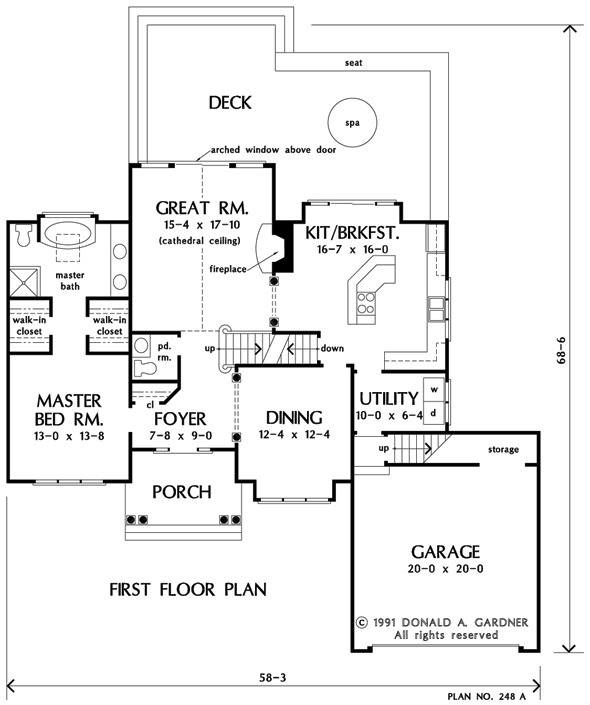 Ft.
House Dimensions: 58' 3" x 53' 5"
Great Room: 15' 4" x 17' 10"
Master Bedroom: 13' 0" x 13' 8"
Foyer : 7' 8" x 9' 0" x 8' 0"
Dining Room : 12' 4" x 12' 4" x 8' 0"
Great Room (Cathedral): 15' 4" x 17' 10" x 16' 6"
Kitchen : 16' 7" x 16' 0" x 8' 0"
Utility Room : 10' 0" x 6' 4" x 8' 0"
Bonus Room (Vaulted): 11' 4" x 23' 6" x 8' 0"
Garage Storage : 12' 5" x 3' 2" x 0' 0"
Master Bedroom : 13' 0" x 13' 8" x 8' 0"
Bedroom #2 (Cathedral): 12' 4" x 12' 0" x 12' 8"
Bedroom #3 : 10' 4" x 11' 9" x 8' 0"
Porch - Front : 11' 3" x 8' 1" x 0' 0"
Deck / Patio : 16' 0" x 15' 1" x 0' 0"
Storage (1st Fl.) : 7' 8" x 3' 3" x 0' 0"